So the basic premise of today's book is time travel through the visiting of past lives (56 of them in the case of a teenaged girl named Alex Wayfare). But these are not touristy past life visits, but science-fictionally masterminded ones. And (as is so often the case) the mastermind in question has been corrupted by the power he wields over the past...and it is his motives and ploys that shape the time travelling. And Alex, when we first meet her, has no clue. She thinks she's just a spaz with weird visions and not friends, and so she shrinks into a cocoon of social outcastness, letting the bullying and unkindness go by unopposed while she tinkers with mechanical things and grieves for her little sister who is fighting cancer. But then Alex starts to move through time (with the help of a mysterious older man who shows up to be her mentor)....and on her first trip back to the past she meets a boy called Blue and feels a strong bond with him. This is especially important to her because he is the first person outside her family she has felt kinship with for ages. At which point, some of us are thinking "oh, time travel romance" but then the twisty speculative fiction side of things ratchets the pace up a notch. There is a backstory to Blue that Alex could never have guessed...a story far stranger than insta romance. And there is danger afoot, as the aforementioned mastermind becomes aware that Alex has been born again, and is travelling once more. This is one I found interesting intellectually, more than warm fuzzy emotionally. On the plus side, I liked very much the premise on which the time travelling was based. The time travelling expeditions were nicely detailed and vivid, especially Alex's time as a sharpshooting gang member in the wild west! Alex inhabits the bodies of her past selves, but without their memories...but with the past persona still able to take over the action as required. It made for a a nicely twisty sort of time travel! It was a good premise, but Alex is a bit of a psychological mess and not the most sympathetic character. Her prime motivation--finding in time travel bonds of affection (ie, making sure Blue cares about her)--is perhaps understandable, but it diminishes the more intriguing scaffolding of the larger worldbuilding and story. Throughout the book Alex, instead of focusing on the bigger picture, is busier getting external validation from all the guys she was encountering--her mysterious mentor in time travel, Blue, and the guys in the past who loved her past selves, and a guy in the present who wants to be her friend despite her asocial prickliness. At which point I started zipping through it like crazy, and the last 60 pages or so went woosh. At which point it becomes clear that this book is essentially a set-up for larger confrontations to come--I am glad that even though the Strange Chemistry imprint is no more, MG Buehrlen is moving ahead with the sequel, The Untimely Deaths of Alex Wayfare. 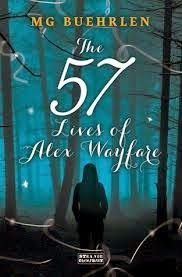 So just for clarity-- I am cautiously recommending/not discouraging anyone from reading The 57 Lives of Alex Wayfare, because it is an interesting read for time travel fans, and there are those who like it much more than me, and maybe you would be one of them. If you want a second opinion, here's a good one at The Social Potato-- note that it's a four star review that's mostly negative!